PRINEVILLE, OR -- A group of residents is again trying to bring an indoor pool to Prineville. The area has an outdoor pool (pictured) that's more than 60-years-old. Zack Ackley, with Citizens for a New Prineville Pool, says despite two failed attempts in the past, his group is mounting another serious effort. "There's a lot of interest for a year-round facility. We have a high senior contingent and they like to swim year-round for wellness opportunities. And, they have to travel to Redmond and Bend and Madras. Also, we're one of the only Central Oregon communities that does not have a swim team for the high school and middle schools. We find a lot of benefit in having a pool year-round." He tells KBND News the last attempt for an indoor facility was in 2007. "We looked at the 2007 feasibility study and tried to pursue information from that. We went out in the community to find out whether the community wanted a pool or not, and we're still working on that. What kind of pool do they want and how much do they want to spend?" According to Ackley, Crook County Parks and Rec started gathering feedback this month, and could ask voters for the funding by November 2017. "There will be a bond to build the pool, and that will be contingent on an operating bond passing. Now, we're trying to minimize that through the grant process and corporate partnerships: The grant process for the building of the pool to minimize that cost. And then, potential corporate partnerships to address the operating expenses." 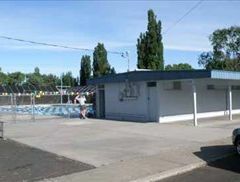 Prineville residents have rejected two other bond requests to fund an indoor community pool, but Ackley is optimistic this third time, the measure will pass.